Take a play break after shopping in Cherry Creek. 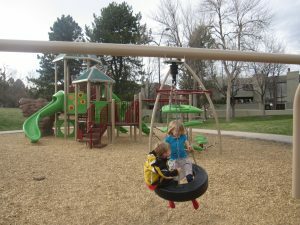 James N. Manley Park in Cherry Creek North is a small neighborhood park that has enjoyed a revival in popularity due to the fantastic new playground that was installed in the summer of 2012. This park is a great place for a post-shopping romp. Park Features: Benches, drinking fountain, picnic tables, playground, and bike/pedestrian path. Open Space Rating: 4 – Limited open space, but if you need a place to play a game of soccer or throw a long-range frisbee, head to the large grassy field of Bromwell Elementary just across the street. Playground features: Climbing feature, tire swing, several slides, bouncy toys, monkey bars, spinning element, wood chips as play surface. Playground Kid Rating: 8 – Lots of fun due to the unique “rock outcropping” climbing feature and tire swing. Bathroom Options: There are no bathrooms at the park. 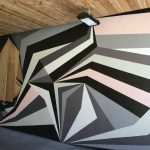 Nearby options include local Cherry Creek shops or the public library on 3rd and Milwaukee. Parent Tip: Be careful where you park in Cherry Creek North as some areas are designated “Residents Only” and require a special permit.